In the initial column we explored an area where the interests of both postage stamp and revenue stamp collectors intersect. In the last column we showed how the postal stationery collectors helped unlock new information about a piece of revenue stamped paper. In this column the revenue collectors return the favor by revealing some new information about an item in the field of postal stationery. Specifically, we turn to some postal stationery essays, the so-called Lockwood essays, a large circular design featuring a profile of Washington. The definitive book on proofs and essays of United States stamped envelopes (Undersander, 2003) relegates our subject to an appendix. Undersander states that “these were not likely essays for U. S. Postal Stationery...” Thorp (1954)is the earliest author who identifies the source of the essays as Lockwood & Co. If the items are shrouded in mystery, their attribution is even more mysterious. My attempts to identify the company and even its location have yielded nothing. A comprehensive listing of these essays (catalog numbers 800a through 800mmm) can be found in Thorp (1954), this long list showing that the essays were produced in 5 sizes; many colors of envelopes; many colors of the stamped design; and the design at left, in the center, and on the right. 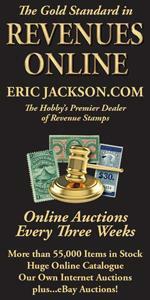 There are a total of 120 listings, 37 on various wove papers and 87 on various laid papers. 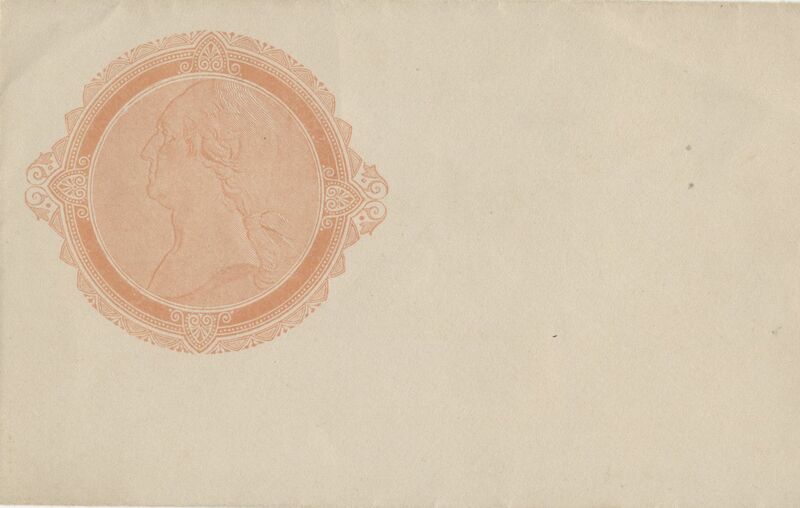 One should not be surprised by the disinterest in most postal stationery collectors for neither denomination nor country of origin graces the design which measures about 50 mm in diameter (measured from top to bottom) and a little wider side to side because of two additional side ornaments. But a profile of our first president, George Washington, faces left in the center of the design, so the United States is the most likely origin of the design. horp and others have used 1874 for a date of production of these essays. That would place their origin at a time when the Plimpton Manufacturing Company was successfully competing for the contract to deliver stamped envelopes. This is the extent of the information that can be gleaned from the postal stationery literature. One should not be surprised that the postal stationery collectors have had only a passing interest in these essays, now relegating them to the land of philatelic limbo. When I began to be serious about the pursuit of revenue stamped paper (Scott-listed with RN prefix) about twenty years ago I encountered these items. They looked like the central portion of the type C revenue stamped paper. 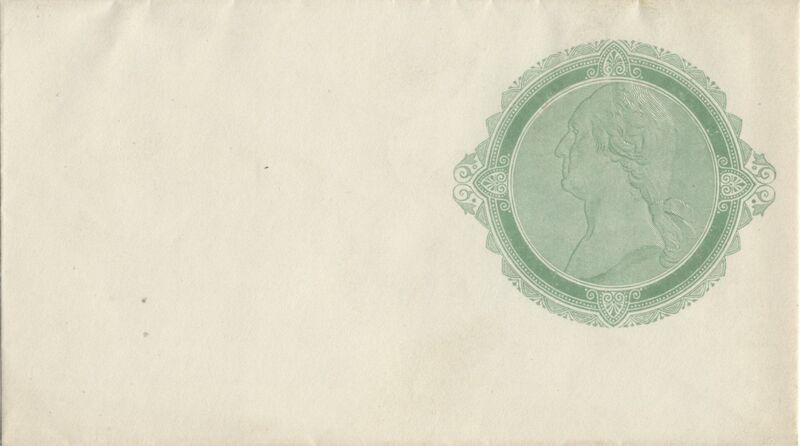 At that stage my interest was only in used examples of revenue stamped paper, no proofs, no essays, and certainly not essays for postal stationery. Even at modest prices, I had no interest in acquiring an example for they were too far afield from my central interest. 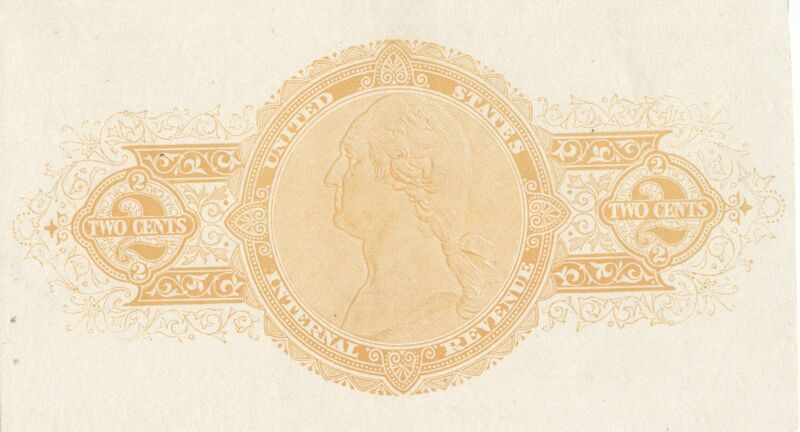 Type C revenue stamped paper is denominated two cents and we learn the American Phototype Company introduced this design in early 1870, at a time when they were imprinting checks, bank drafts, bills of exchange, receipts, and certificates of deposit. The large type C design was probably introduced at the suggestion of Internal Revenue for a larger horizontally oriented design which would cover more of the instrument on which the design was being imprinted. Coincidentally the Joseph Carpenter firm had put into service a larger circular design in 1867 (Type H). 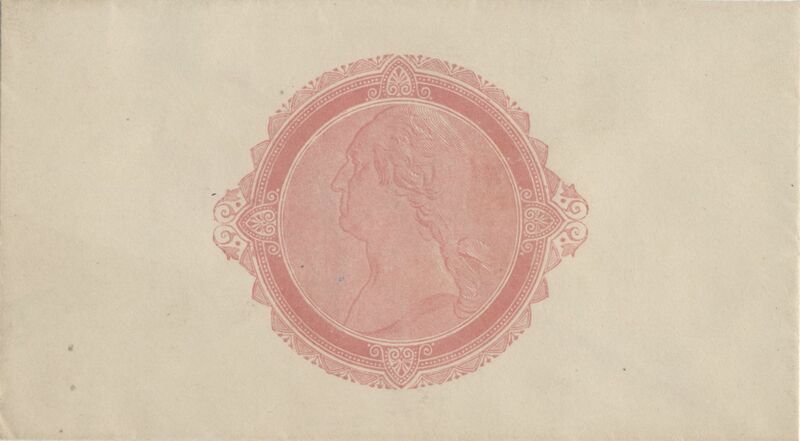 Subsequently a large horizontally oriented design (Type J) also featuring a left-facing profile of president George Washington by the beginning of 1872, perhaps because of the success of the American Phototype’s type C. The type C imprint was in service less than two years, replaced with the type E, featuring a profile of Benjamin Franklin. As I gradually began to broaden my philatelic horizons, it became obvious that Lockwood & Co. was not the originator of the mysterious envelope essays, but rather the American Phototype Company must have produced these items. Clarence Brazer wrote in the January 1951 issue of the Essay-Proof Journal, on the American Phototype’s production of the types A through F revenue stamped paper and their submission of the low bid for the contract to print postal cards in 1877. So essays for a contract to print envelopes from the American Phototype company is reasonable. Thorp wrote that these essays were produced in 1874, when Plimpton became the successful bidder for producing stamped envelopes. 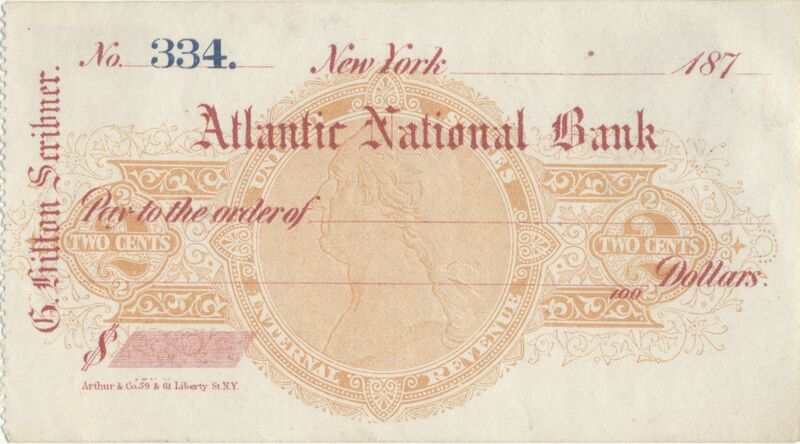 Given that the American Phototype Company had abandoned this design for revenue stamped paper several years before, it seems more reasonable that American Phototype might have submitted these in the 1870 competition when George H. Reay of Brooklyn obtained the contract to produce envelopes for the Post Office Department. What remains uncertain at this point is why Thorp attributed these essays to Lockwood and Company and why the date 1874 was assigned for their production. Did Lockwood produce the envelopes on which the American Phototype printed their designs? Was this intended as a joint venture? Without some additional documentation we seem to be left with many questions about the origins of the essays. What seems certain, however, is that the designs were the work of the American Phototype Company of New York City, the company that initially had the exclusive contract for imprinting revenues. And for ten years they remained the primary contract printer for producing revenue stamped paper. So let’s remove these Lockwood essays from philatelic limbo and restore them to the legitimacy of essays for stamped envelopes produced by the American Phototype Company. The author would be glad to hear from anyone who can shed any light on Lockwood & Co., the nature of their business, and where they were located. Undersander, D. (2005) Catalog of United States Stamped Envelope Essays and Proofs. United Postal Stationery Society, Norfolk, VA.
Thorp, P. H. (1954)Thorp-Bartels Catalogue of the Stamped Envelopes and Wrappers of the United States (6th Edition), Netcong, NJ.